Welcome drink will be served Thursday 6 Sept, 16.30 at Moltkes Palace. The Congress dinner will be held on Friday 7 Sept at restaurant Paafuglen (The Peacock) serving classical Danish dishes. 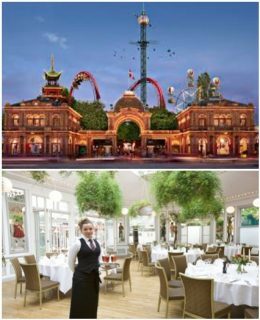 The restaurant is located within the Copenhagen Tivoli Gardens, one of the oldest amusement parks in the world, entrance fee to the Tivoli is included in the dinner ticket. Tickets are 55 Euros and are NOT included in the registration fee but must be purchased separately for delegates and accompanying persons at the registration site. “Copenhagen has attractions and sights to suit every taste and interest – and most of them are within walking distance. With a history that dates back to 1043 the city is full of historic landmarks, significant buildings and interesting sights and museums as well as plenty of good dining and shopping opportunities”.